US, 2011, 92 minutes, Colour. Thomas Dekker, Mira Sorvino, Lynn Collins, Joseph Morgan, Elizabeth Mc Govern, Kate Walsh. 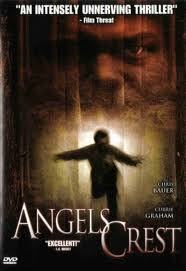 Angels Crest is a psychological study of life in a small town. The central focus is a young man, Ethan, who has care of his young son. They have bonded together – and he takes him out into the snow, leaving him in his vehicle while he chases a deer, only to return and find the child has disappeared. There is a wide search throughout the area for the child, Ethan finding him dead in the ice. There is a hostile reaction in the town, fostered by the district attorney (Jeremy Piven) who has lost his own son in the past. There is hostility also from Ethan’s partner, Cindy (Lynn Collins giving a very different performance from her Portia in The Merchant of Venice and her princess in John Carter of Mars). There is a strong supporting cast including Mira Sorvino as a waitress in the diner, Elizabeth Mc Govern as an older waitress and her partner, Kate Walsh. Thomas Dekker is an odd choice for Ethan. He has the weird vulnerability look, strange eyes, seemingly too young for the role in which he is cast. He also gives a performance of some anguish. Much of the film focuses on Cindy, her alcoholism, her promiscuity, her missing her child, her clash with her mother, who has religion and is critical of her daughter (Barbara Williams). There is also the relationship with Rusty (Joseph Morgan), a friend in the town. The two strands for the resolution of the plot include discovering that the baby chair which held the young boy was able to be opened easily by children. There is also the preparation for the court case – and Ethan going with his gun out into the snowy mountains. 1. A psychological thriller? Life in a small town, isolated? Issues of family, children, death? 2. Angels Crest, the beauty of the location photography with the mountains and the forests? The contrast with the town? The homes, touch of the squalid? The diner? The court? The musical score? 3. The irony of the title? The focus on children? Death? 4. The opening with Ethan and his son? Playing in the house? Going for the ride? The bond between father and son? Ethan going after the deer, the return, discovering Nate missing? Everybody gathering for the search? Ethan’s growing desperation, Rusty’s arrival? Searching through the night, Ethan’s fall, collapse, finding his dead son, bringing him back to the group? 5. The consequences for Ethan, his being arrested, negligence? The hostility of the DA? The people in the town, writing ‘guilty’ on his truck? His clashes with Cindy? The discussions with Rusty and Rusty telling the truth about being with Cindy? The friendship of Jane and Roxanne, their support? Angie and her support? His working on vehicles? Going back to his house? The puzzle about the baby chair, going online, trying to find out what was wrong? Taking Rosie for the ride, Angie and her reaction? His discovery that the children could get out of the chair? 6. Cindy, her relationship with Ethan, her drinking, promiscuity, giving up her son? With Rusty? Her sluttish behaviour? Her mother’s arrival, her mother’s criticism? The religious background? Cindy and her defiance? Being interviewed by the DA? Her missing Ethan, trying to help? The possibility of a reconciliation? 7. Angie, her support of Ethan? Working in the diner? The end, with her daughter? Jane and Roxanne, as a couple, their looking after Nate? Their support of Ethan? The discussions with the DA? 8. Rusty, friendship, with Cindy, his own marriage? His helping Ethan, getting Ethan to stay with him? 9. The DA, his hostility, his interrogation, wanting to find evidence against Ethan? 10. The range of people in the town, the issue of negligence for the child’s death? Reactions? 11. Ethan, his discovery about the truth of the baby chair? His going out into s show, not going to the court case, taking his rifle? Audience response to the themes of child death? Negligence? Accidents? The law? Personal feelings and hurt?